Vance Township Police Chief Pete Adams, of course, is not happy with this setup, especially when he finds evidence implicating Zoe’s new houseguest in murder times two. When Zoe ignores Pete’s dire warnings, she runs the very real chance of burning one too many bridges, losing everything–and everyone–she holds dear. 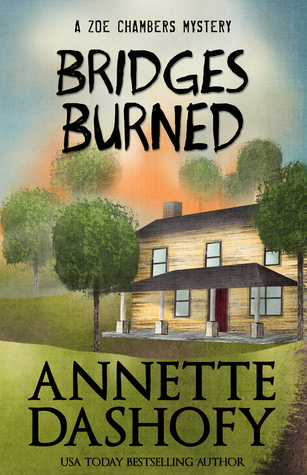 Bridges Burned is the third book in Annette Dashofy’s Zoe Chambers mystery series. It’s an intensely suspenseful read and, I think, my favorite of the series to date. I so admire how Annette Dashofy brings her characters to life. She really gives each character a unique voice and that little detail is a huge reason why I so enjoy her writing and this series. This book was a nail-biter, for sure! Zoe and Pete, friends and colleagues for some time, are navigating the waters of moving their friendship into a more romantic zone, but it certainly isn’t going smoothly. Just as their romantic relationship is trying to find its feet, a fire breaks out–the results of which drive a wedge between Zoe and Pete. The tense moments between the pair are full of missteps and mis-communication and I worried constantly that their romance would be over before it ever really began. Honestly, it was like watching a scary movie when you shout at the screen that the killer is right behind that door! Don’t go in there! I had been harboring feelings of suspicion for one of the characters right from the start and, as it turns out, my suspicions were well-founded! As the evidence that Zoe and Pete uncover along the course of the story emerged, I was more and more sure of my feelings about who the villain was – and I was trying my best to tell Zoe and Pete. But, alas, neither character listened to me until it was almost too late. Bridges Burned is an engaging story full of intense and hypnotically suspenseful plot twists. I was engrossed in the story from the beginning and I’m really looking forward to what comes next. I feel that the story ended at just the right point–enough had been resolved and yet there are big threads left dangling, as well. Stay tuned! I know I sure will be! My thanks to Henery Press, who gifted me a copy of this book in exchange for an honest review.